Why hang bamboo wind chimes at the front door? You probably already know that wind chimes are just a special treat to listen to wherever they are hung but do you know why they should be positioned at your front door? This concept is very important in Feng Shui however, you don’t have to practice living harmoniously with your surrounding environment to appreciate this home decorating tip. Feng Shui practitioners believe that positive energy in your home is crucial for health and happiness. A door provides such a a large opening that energy can easily escape so wind chimes, especially bamboo, will chase negative energy away while keeping positive energy inside. It is also said that strategically hung wind chimes can help the mind transition from the busy outside world to the inside tranquil environment with ease. If these reasons aren’t enough for you, some also suggest that bamboo wind chimes hung at your door will attract money and good luck! 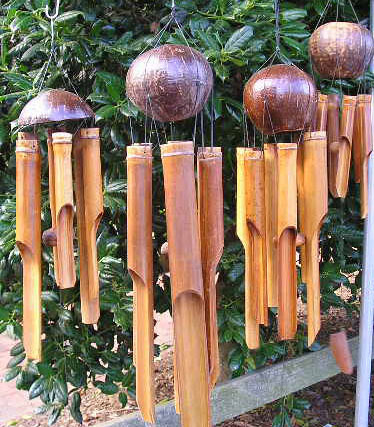 Bamboo wind chimes should be appropriately scaled to the door size. A small, single doorway should have small chimes but someone with double doors or a large opening will need larger chimes for them to properly do their job. Be sure to position your bamboo wind chimes so the wind won’t blow them against the door and no one will hit their head on them. Never hang them with a plastic hook, only metal as this material is also an important element in the practice of Feng Shui.